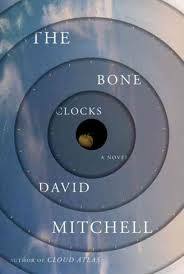 The Bone Clocks moves along quicker than The Cloud Atlas, by the same author, and seems to flow better, in my opinion. It begins in 1980 with Holly Sykes, a 15-year-old London girl, who has an ugly row with her mother, then the earth shattering betrayal by her older, illegal, boyfriend and her best friend. Then she runs away. Slowly, we go through personal stories of each individual, with sudden steps into the paranormal. Each interweaves with the other, a 14-year-old girl, a war correspondent, a young con man, a literary writer, and more. Getting closer to an event of proportions we cannot guess. But it will change lives.